Our 2018 Safety Progress Report includes all of the findings from the new survey, as well as year-over-year comparisons. See how well EHS pros and their organizations are moving the safety needle in a positive direction, eliminating challenges, and checking off the required boxes necessary to meet the very important objective of protecting workers in all industries. This survey sought to understand how organizations are approaching First Aid, cardiopulmonary resuscitation (CPR), and automated external defibrillator (AED) training. Sent to a population base of approximately 200,000 BLR Media subscribers. 1,052 EHS professionals interacted with the survey, 636 of whom proceeded through to the end of the questionnaire. Our Participation-Based Safety Survey sponsored by eCompliance® was launched in early May 2017. By the time the survey closed about one month later, 502 environmental, health, and safety (EHS) professionals had shared their insights into how their companies are encouraging employees to actively participate in safety initiatives in order to promote consistently safe behaviors on the job. Find out what respondents had to say about participation-based safety. The goals for this survey and the Annual Safety Progress Report based on its results were multifaceted. Our aim was to not only provide the safety industry with valuable insight into current challenges, but also to help facilitate safety improvements with relevant resources throughout the year and record progress annually. We wanted to perform research that would help ensure we are all moving the safety needle in a positive direction, eliminating challenges and checking off the required boxes necessary to meet the very important objective of protecting workers in all industries. See what respondents had to say! Our Lockout/Tagout (LOTO) Survey sponsored by Accuform® was launched in early January 2017, and by the time the survey closed about two and a half weeks later, 576 environmental, health, and safety (EHS) professionals had shared their insights into the state of LOTO at their companies. The 2017 Hazard Communication Survey sponsored by VelocityEHS® and its MSDSonline solutions was launched in mid-June 2017, and by the time the survey closed about one month later, 449 environmental, health, and safety (EHS) professionals had shared their insights into how their organizations are currently meeting their hazard communication challenges. Find out what respondents had to say about HazCom/GHS! As an EHS professional, it’s hard to tell if you are being paid competitively, and as an employer, it’s hard to tell if you are offering salaries that are competitive and efficient. 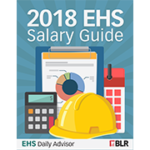 BLR’s 2018 EHS Salary Guide will help you evaluate if you are being paid a fair amount for the responsibilities you are shouldering or if you are paying the right amount to retain hard-to-fill positions but not overpaying on others.